Apple CEO Tim Cook has taken to Twitter to commemorate Veterans Day, with a photo featuring some of the veterans that work at the company's Cupertino campus. The tweet is simple, with Cook saying that he appreciates current and past veterans for their sacrifice. 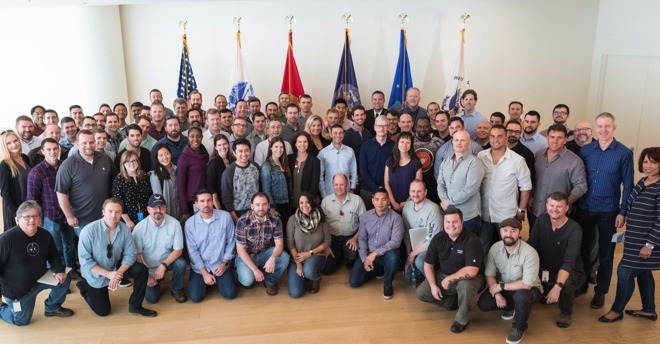 "Proud to work alongside these & many more veterans at Apple," Cook said in the tweet. "We honor all the brave men & women who sacrificed for our freedom." The picture depicts the crowd in front of an American flag, and flags from all the branches of the U.S. armed forces. Veterans day was originally established in the U.S. in 1919 as Armistice Day by President Woodrow Wilson, and is currently celebrated every year on November 11, after a brief shift to the fourth Monday of October. It was modified to become Veterans Day in 1954. The holiday coincides with Remembrance Day and remaining Armistice Day observances in other countries intended to mark the anniversary of conclusion of World War I. Veterans day is a holiday celebrating the service of all past, present, alive, and deceased veterans.